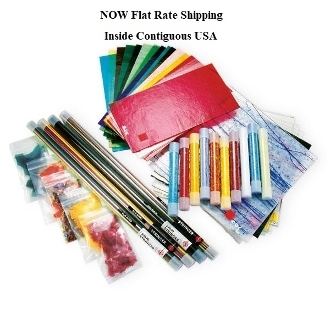 A sampler of time-tested favorites: approximately twenty colors of 3 mm and 2 mm fusible sheet glass (9 sq ft/0.84 m2), ten tubes of colorful frits, five bags of confetti and four tubes of assorted colored stringers. Ideal for beginners, experimentation, or jewelry projects. Shipping dimensions: 16 x 8 x 11 in(406 x 203 x 279 mm). Shipping weight: 20 lb (9.1 kg).